Magento 2 WhatsApp Share extension by Meetanshi allows visitors to instantly share your Magento 2 store products on most popular messaging app WhatsApp and its web version just with a single click. Enable WhatsApp share globally, product specific or category specific. UTM tracking to analyze the traffic from WhatsApp share in Google Analytics. Supports WhatsApp Sharing through both the mobile app and web versions. "You are smart when you promote, and smarter when you get promoted"
There is no doubt in WhatsApp being the most popular messaging app. The statistics say that WhatsApp has 1.5B monthly active users and supports 60 languages! Using WhatsApp for promoting your store products is a boost to your E-commerce business strategy. Meetanshi has developed Magento 2 WhatsApp Share extension to encourage product sharings in mobiles and web through WhatsApp just with a single click! Magento 2 WhatsApp Share extension allows the users to share the products they like with their WhatsApp contacts with ease. It leads to the marketing of your product on a very popular platform. The shared message that contains product description with the URL will prompt the reader to visit your site and check the product. Such actions help store owners reach to potential customers. The extension comes with many additional features. Admin can enable UTM Tracking code in the URL which helps analyze the traffic gained from the WhatsApp share with the help of Google Analytics. The message to be shared on WhatsApp can be easily customized by the admin. Share product with the URL, description, price, special discounts, and coupon codes to lure the reader for conversion. Lets customers share your products along with the description, name, price, discount, special price, URL etc. with their WhatsApp contacts. Allows admin to enable or disable the extension in 3 ways: globally, product specific or category specific. Choose WhatsApp share icon or image to show in frontend. Easily share coupon code or special price of the products to encourage visitors to visit and purchase. Setup custom message for the discount coupon code and special price. Enable UTM tracking code to analyze the traffic from WhatsApp share in Google Analytics. Rather than sharing long product URLs, the extension facilitates to share short URLs using bit.ly. Additionally to WhatsApp one to one contacts, share Magento 2 store products with Whatsapp groups and broadcast lists as well. With the feature to share coupon code, I have seen a tremendous boost in traffic! 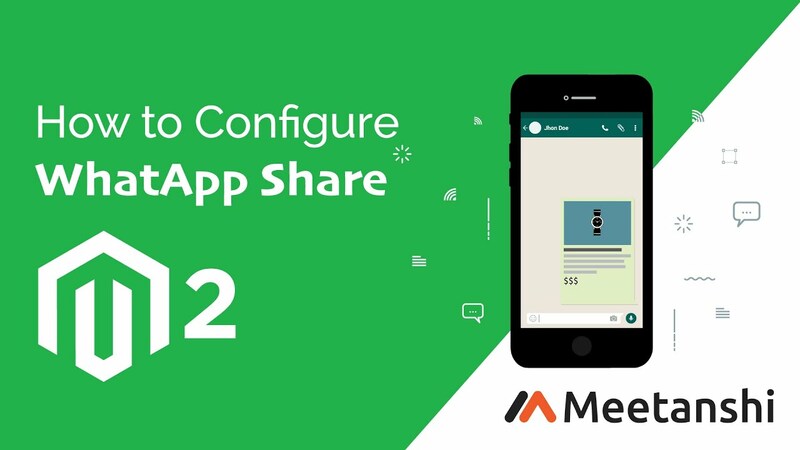 Ultimate whatsapp share for Magento 2!